Monday was the sixth off day of the year, and I took it easy most of the day. I had physical therapy and occupational therapy appointments in the morning for my knee and elbow, respectively. The physical therapist didn’t think it was an MCL tear because he bent my leg certain ways and there wasn’t pain. Whatever it is, I don’t like it, and personally I think rest is the only thing that will make it go away. So hopefully in November it will feel better, but the way it’s going right now I’m thinking October (if you catch my drift). He gave me some exercises to increase the flexibility of my quads and hamstrings, because he thinks the tightness in those muscles could be adding stress to the knee and hip. We’ll see how it goes. Ok, back to M162 (shorthand for Brewers Mission 162, if you must know). I met Victoria for lunch at Noodles in Madison at 12:30, then went back to the apartment to get stuff packed up for the week ahead. I left Madison around 3:30, and pulled into the Brewers 1 Lot at 5:15. Again I walked around and told people about my mission and Be The Match. When I asked a group if they had heard about the guy going to all 162, a girl said; “yeah, I made the jersey for him!” I said thank you, introduced myself, and went on with my spiel. She said she was confused when asked to put three numbers on a jersey, and never really got an explanation as to why. I had offered my extra ticket on twitter in exchange for a $25 donation to Be The Match, and @Phoebe0221 was the winner. She wound up donating $30, and I’m very grateful for the contribution (and so is Be The Match). I met Phoebe outside of the home plate entrance around 6:00 pm, and we proceeded inside. 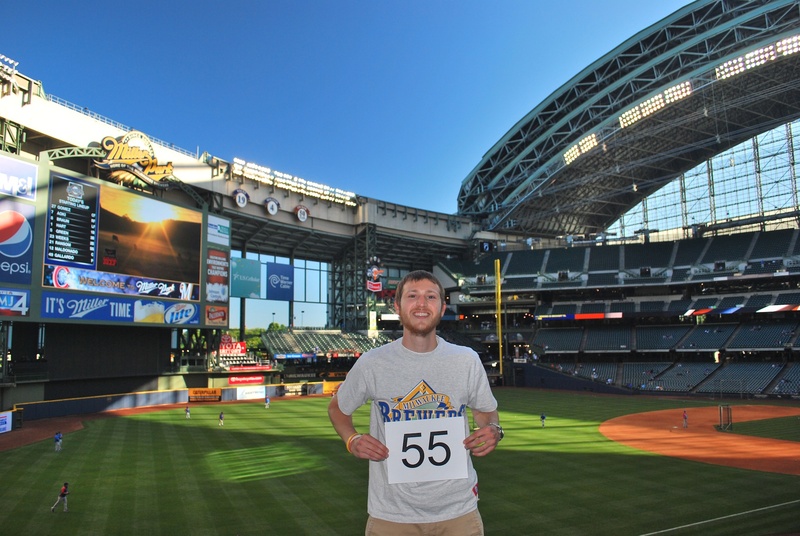 We went to section 230, and got game number photo 55 taken care of shortly thereafter. It only took two tries, and Phoebe did a great job. She did everything that I asked and it would’ve only taken one take but I was holding the number in such a way that it was almost unreadable due to the reflection. The perfect conditions and absence of the sun in the background definitely helped our cause. After getting the game number photo we had about 50 minutes before the game was set to start. We walked around the press box in the loge level so we could go down the staircase that Bill (the friendly usher) mans. As we were descending the steps I noticed a familiar face on the platform that holds the loge level camera. 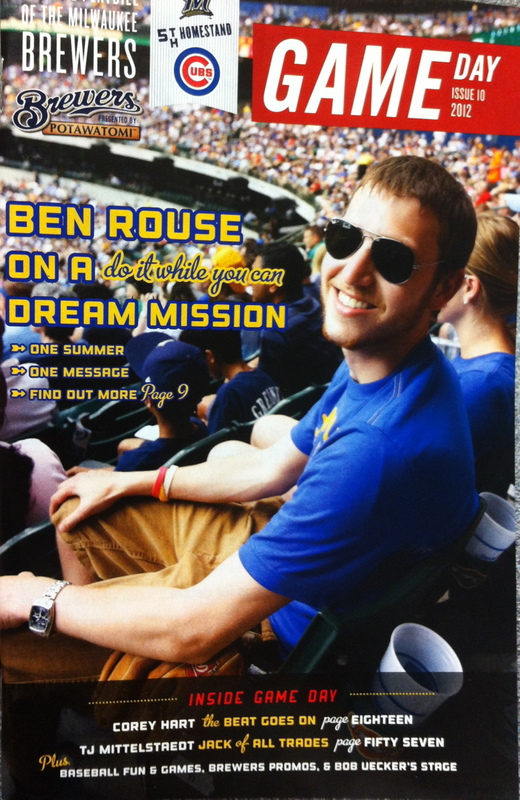 This is the (FREE) Game Day magazine that the Brewers have available throughout the ballpark. The stories are different for each home stand, and the covers change for each series. My story will have been visible for nine games when the home stand is over, so that’s pretty cool. The game got underway and with how many strikeouts Yovani Gallardo was racking up, you’d think it was a good game for the Brewers. That was not the case. Four of the first five batters for the Cubs reached base, and they jumped out to a 3-0 lead thanks to a three run home run off the bat of Alfonso Soriano. The Cubs Ryan Depster was dealing, and he retired the first 15 batters he faced. For that he deserves a photo in the blog. 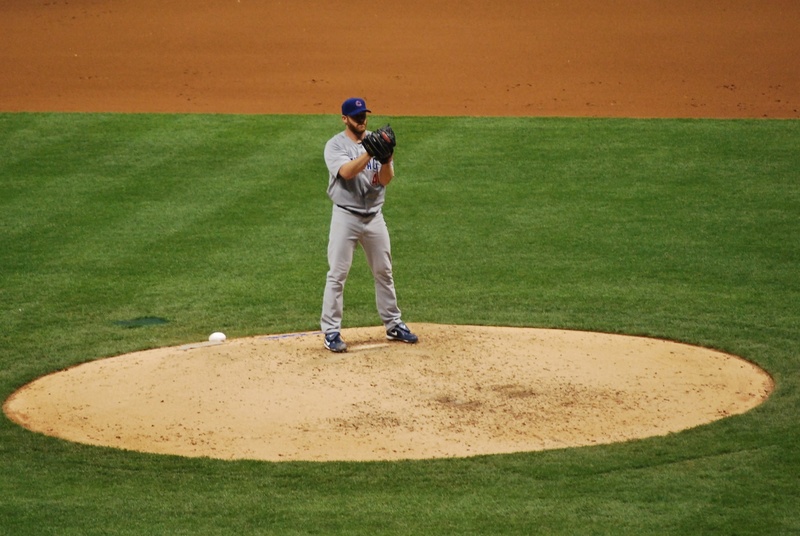 If you’ve seen Dempster pitch, you may notice that he does a weird glove shaking routine as he’s preparing to pull the ball from his glove and deliver a pitch. He throws a split fingered fastball, which requires you to really dig into the glove (while getting your index and middle finger wedged around the ball). He does the glove wiggle on every pitch so the batters can’t tell if he’s wedging his fingers around the ball to throw the splitter, or throwing a pitch with a normal grip. The 16th plate appearance for the Crew resulted in a base hit, and the Crew didn’t have to worry about a perfect game or no hitter any longer. I had tweeted “Cough-perfect-game-jinx-jinx-jinx!-Cough” so I’ll take the credit for the non no-no. Phoebe is kind of a Cubs fan (don’t ask) but was wearing a Brewers shirt and (kind of) cheering for the home team. She did admit that it would’ve been cool to see a perfecto or a no hitter. I’ve already witnessed a no-no, when Justin Verlander no-hit the Brewers at Comerica Park in Detroit back in 2007. 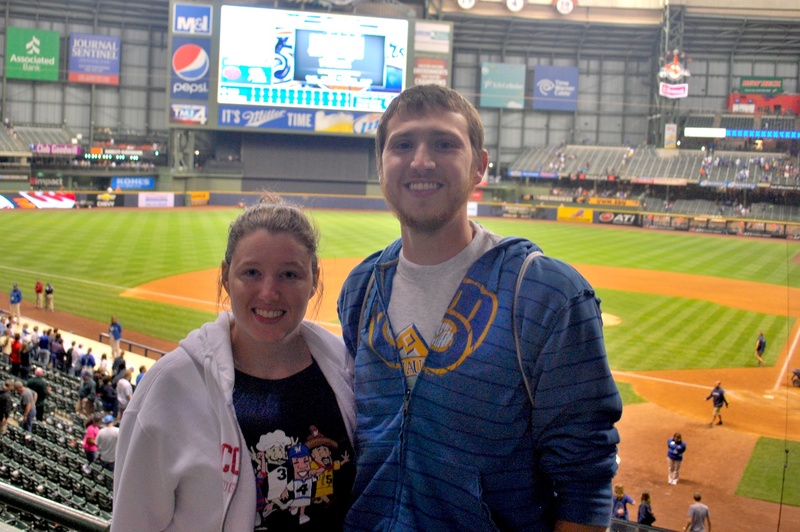 Since I had already seen the Brewers get no-hit once, I was in no mood to see another. It was weird glancing up and seeing this after Ransom’s at bat. I had almost forgotten what it was like to have a guy on base. By the sixth (when Ransom reached) the Cubs had already tacked on two more runs, one of which came via another Cubs home run. The Cubs added three more runs in the eighth inning, and two in ninth. 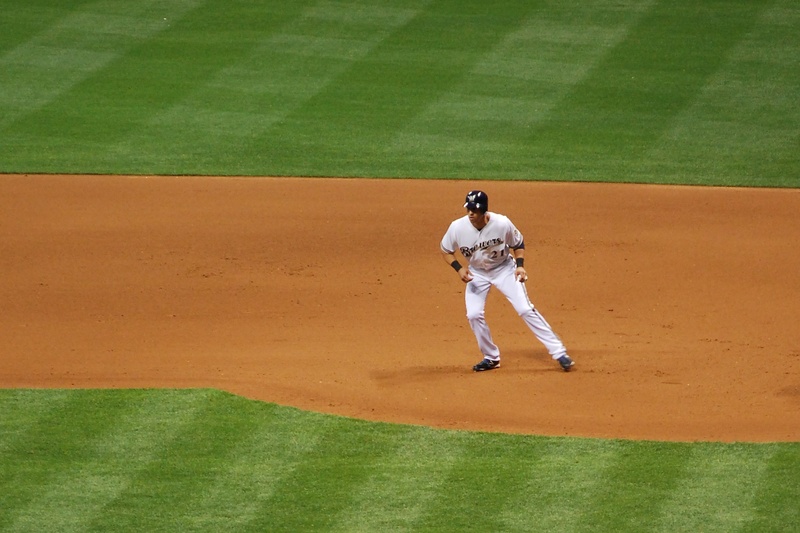 The Brewers best chance came in the eighth inning, when they had runners on second and third and nobody out. The next three batters were all set down, and the Brewers failed to score in the ninth as well. Final Score: Cubs 10 – Brewers 0. It marks the fifth time that the Brewers have been shut out this season. After the final out I had a (Cubs) fan take a picture of Phoebe and me. The lady’s hat was blocking the flash from opening, so this was the best picture we could get. I could’ve asked her to take another one (for the second time) but I wanted to get home and rest. After every game I go to ESPN.com to see the total number of pitches thrown in the game. Their box scores sum up the total number of pitches seen by each batter, and then sums them up for the teams. It always seems like the Brewers throw more pitches than the opposition, and I went to MLB.com and checked out the sortable team stats. Spoiler alert: I was right on the money. The Brewers have thrown 8,557 pitches, while the Brewers hitters have seen 8,140 pitches. It actually isn’t as big of a disparity as I would have expected. However, the Brewers pitching staff has thrown the most pitches in the MLB. They’ve thrown almost 1,000 more pitches than the most efficient team, the Minnesota Twins. The Twins have an even worse record than the Brewers, so I can’t really say that throwing fewer pitches means anything, but I find it alarming. The more pitches a team throws the quicker they’ll wear down, or at least that’s my opinion. Having Greinke and Gallardo on a staff (strikeout pitchers) is one reason for the excess pitches, but it’s not the only reason. Enough rambling, it’s time for bed.